41mm x 41mm, 2.5mm Slotted Channel Sections, Available in 3m and 6m Lengths of Pre-Galvanised Steel or Hot Dip Galvanised Steel. These standard duty channel sections have been designed to provide a versatile and economical solution to industrial framing and support problems. The system comprises 2.5mm rolled galvanised steel channel sections which may be easily assembled / modified using brackets, spring nuts and bolts. 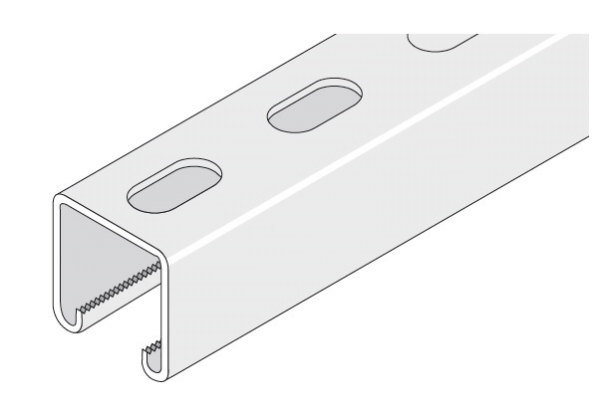 Slotted Channel Sections have holes provided to facilitate interconnection or fastening to underlying building structures. Available in 3m and 6m Lengths.